I let him walk away to continue his breeding cycle! I started walking up the road, he's going to come down, cross the road way up there and his tines are going to be way deeper, he's a shooter, I know it! I walked, and walked, the Quad was a dot behind me when I finally knew, the trophy mule deer Buck was in rut, but not as dumb as I though, he went over the top and stayed there, safe from the half frozen hunter down below!!! I turned around and hiked back to my bike, I had about 15 K's to make it back to the house, and in this cold that's a long, long, ways! On the way down I met a truck with 2 guys and a young fellow with them, we both stopped and I asked them if they were hunting Mule Deer? You Bet was the answer, so I thought, it would sure be nice if these guys could get that Trophy Mule Deer Buck I saw with the young guy with them! I told them where I'd seen it, where I thought it may go, and off they went. I found out later, they had hiked around the area, but the big guy was no where's to be seen, that's the way it go's sometimes! I hit the trail down to my place at around 3:30 in the afternoon; boy did I want to go someplace warm! I sat there for a second, hummed and hawed, and said" I'll give it one last try, so I kept going past my trail, way up another mountain, it was so cold by then I could hardly keep my eyes open! I started up a trail the go's to the top and about half way up I stopped, way up the side hill stood a few does, so off the Quad I get, load the 300 Win Mag and walk about 50 yards up to get a good look. ...Just does, I was on my knees, slowly freezing to death waiting for a huge Buck to walk out, nose to the ground, but I watched and watched and nothing, just one doe left, it was starting to get dark and I cannot move it's so cold! As I watched the last doe, it kept looking to the top of the hill, it would walk around, stop and kept looking up, this went on for 20 minutes or so as though a trophy mule deer buck were up there. I glassed and glassed the hill top, nothing even poked it's head over! Well, the lights fading, I'm near death; it's time to go home. That night after sitting in a steaming Tub of Scalding water for a good hour I started to think, "You Know, that doe was waiting for a huge trophy mule deer buck, he's just over the top of the ridge, probably smelt me or saw me!" This gnawed at me for most of the night! I've got to give it one last try I thought! Next morning I was back at that same side hill before first light, I parked the Quad at the fork in the snowed in road and walked in about 600 yards, there I waited for Legal Light! Well, after about a half hour of glassing nothing but snow I thought this is crazy, it's got to be minus 20, a wind blowing and I'm a step away from Hypothermia! So back to my Quad I walk, well one last kick at the can I figured, let's go to the top of the mountain, turn around and go get warm!!! So up I went, the road go's up in a big U, it circles to the left, so it comes out way above where I was watching the does the night before, so there was still the last chance they could be at the very top of the mountain. No one had been on the road since I traveled it last night, and low and behold as I started up there was the tracks, and boy was there fresh tracks! I kept driving up the mountain, slowly looking at every tree and bush, every little hollow; my eyes were straining to find this huge Mystical Buck! I turned the corner and kept going up, as I came around the top curve, there they were!!! Holy Cow, I wasn't sure how many does were there, it didn't matter!!! There... in the middle of all these does he stood!!! I was off the Quad, gun loaded and Bino's up in a second flat!!! Man oh Man!!! I seen the Biggest, highest rack I seen all year!!! 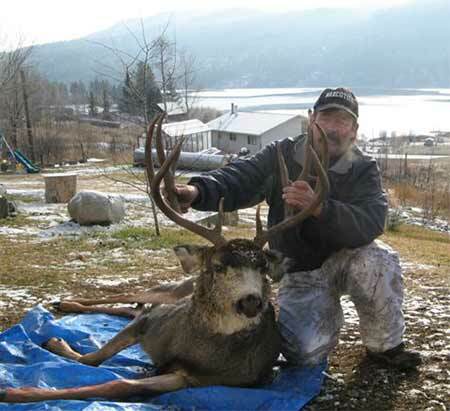 A real British Columbia Trophy Mule Deer! Down go's my glass, and up comes the 300 Win Mag, I was shooting a T3 with a Bushnell 4200 Scope, boy was it clear! The buck never moved an inch, I had him in my cross hairs, waiting for him to turn his head so I could be 100% sure this was the one I waited all season for! Well, he didn't want to turn his head! The does milled around, they feed a bit and kept looking at me! Big Louie just stared at me, not moving, just staring, like if he looked at me long enough, I' disappear and he could keep romancing his Harem!!! Well, I wasn't going anywhere! He stared at me with glassy love struck eyes, and back I stared with my 4200 Scope! After 4 or 5 minutes, which seems like a full day he slowly started to turn his head, the last of the does were starting to move away from our staring contest! As he turned, I quickly make sure this was the one, I slowly squeezed the trigger and fired! The recoil from a 300 Mag is enough to knock your hat off, so for a second or two, I lost sight of my Buck! Up with Bino's, where was he??? The shot was around 100 yards, a very easy shot, I knew I didn't miss! The next instant I spotted him, he was down right where had stood, staring at me, he started trashing around for a second or two and that was it!!! I had my dream trophy mule deer buck!!! British Columbia Trophy Mule Deer!!! There's such a thing as Ground Shrinkage, well the closer I got to this guy there was no Shrinkage! As I grabbed him by the horns and lifted his head back up the yells echoed in the freezing air!!! I did it! That was the coldest, longest hunting season I can remember!!! But, boy was it worth it!! And I'm still bloody cold from that trip!!! The way you told this story I feel like i was there on the top of that hill with you. Amazing description. First time on this site and loved it. Its good to see that your patience is the first priority when it comes to trophy mule deer hunting. I am very happy to see that you are passing your hunting skills down to your children and your grandchildren. They will enjoy the sport of hunting for many years to come. Very nice story mr. dean, definately worth high marks. And congratulations.